麦奶肽检测GLUTEN/CASEIN PEPTIDES TEST - 大平原实验室 - CDIOS 全面发展干预系统 - Powered by Discuz! 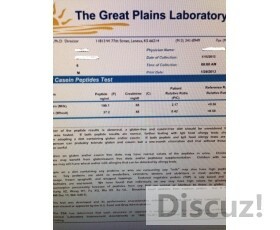 The Gluten/Casein Peptides Test can determine the inability to digest wheat, rye, barley, and milk. These undigested proteins, called peptides, are associated with gastrointestinal, neurological, and neuro-developmental disorders. Urinary peptides are incompletely broken down pieces of protein. The peptides from gluten and casein can react with opiate receptors in the brain, thus mimicking the effects of opiate drugs like heroin and morphine. These compounds, called neuropeptides, have been shown to react with areas of the brain's temporal lobes that are involved in speech and auditory integration. Neuropeptides also decrease the ability to feel pain and effect cognitive function. Most people who have food allergies to milk and wheat also have problems with peptides from these foods interacting with their brain and causing an opiate-like effect. However, some individuals may not show a food allergy to milk or wheat, but have the peptide problem and vice versa. Because of this, we recommend the Gluten/Casein Peptides Test be taken in addition to our food allergy testing. Gliadorphin (or gluteomorphin) is a peptide derived from the wheat protein gluten. Other related grains such as rye, barley and oats also contain the sequence of amino acids found in gluten. Gliadorphin is very similar to casomorphin. Gliadorphin has been verified by mass spectrometry techniques to be present in urine samples of children with autism. Both casomorphin and gliadorphin are composed of seven amino acids, which are abbreviated below. Both caseomorphin and gliadorphin start with the beginning N-terminal sequence tyr-pro (for tyrosine and proline) and the additional pro (proline) in positions 4 and 6 of both peptides, as indicated below. Casomorphin is a peptide derived from the milk protein casein. Casein is one of the major proteins in the milk of all mammals including cows, goats, and humans. Dr. Reichelt in Norway, Dr. Cade at the University of Florida, and others found that urine samples from people with autism, PDD, celiac disease and schizophrenia contained high amounts of the casomorphin peptide. These peptides could also be elevated in other disorders such as chronic fatigue, fibromyalgia, and depression based on anecdotal reports of symptom remission after exclusion of wheat and dairy. 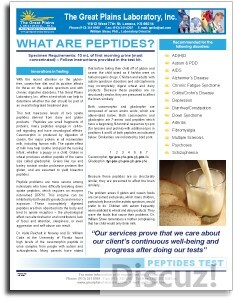 Why are These Peptides Important? The peptides from gluten and casein are important because they react with opiate receptors in the brain, thus mimicking the effects of opiate drugs like heroin and morphine. These compounds have been shown to react with the brain's temporal lobes that are involved in speech and auditory integration. Children with autism frequently seem addicted to wheat and dairy products. Presumably, people with autism and schizophrenia incompletely digest wheat and dairy products. These incompletely digested peptides are then absorbed into the body and bind to opiate receptors, altering behavior and other physiological reactions. – Email to The Great Plains Laboratory, Inc.
"I like the work of The Great Plains Laboratory, and the book and conferences by Dr. Shaw. I have sent samples from my patients for detection of organic acids and morphine peptides in urine and now they are improving greatly with the results you have recommended." 10 mL of first morning urine before food and drink is preferred. The patient must discontinue soy proteins one week prior to collection of specimen (soy bean oil and soy lecithin are considered acceptable).